The location is at Malanyu, northwest Zunhua, Hebei Province, 125 kilometers from Beijing. Included among the tombs are the Xiaoling of Emperor Shun Zhi, Jingling of Emperor Kang Xi, Yuling of Emperor Qian Long, Dingling of Emperor Xian Feng, Huiling of Emperor Tong Zhi, four tombs of empresses including Empress Dowager Ci An and Empress Dowager Ci Xi, and five tombs of imperial concubines, in addition to a princess' tomb. The East Tombs are the largest and most complete complex of imperial tombs in China. Of these, the Yuling mausoleum of Emperor Qian Long and Dingling mausoleum of Emperor Dowager Ci Xi are the most magnificent. But in 1928 the underground palaces were blown open by warlord Sun Dianying, many precious articles were looted and the tombs suffered heavy damage. Scenery around the East Tombs is most beautiful. Qing government rules designated the tomb area as geomantically favorable and forbidden to people. Fifteen tombs are arranged from east to west along the southern foot of Changduan Mountain. Behind the tombs are rolling hills and in front is a long spirit path. Along the central axis of the complex form a unique natural scene is presented as the temples and palatial structures, with red walls and golden tiles among pines and cypresses of verdant green, glitter in the sunshine. They seem as islets dotting a vast green sea. The Dragon Beard Ditches of each tomb, large and small, zigzag and coil like dragons; streams under stone bridges are like white belts through the forest of pines and cypresses. In early morning or late afternoon one can see through green branches and leaves the beamed eaves, pavilions and garrets, stone sculptured human figures and stone animals appearing through the foliage to be draped in thin yellowish gauze kerchiefs. Construction of the East Tombs It was said that, during the Shun Zhi reign of the Qing Dynasty (1644-1661), Emperor Shun Zhi went hunting on a trip that reached the area of Xiaoling mausoleum at the foot of Changduan Mountain. Reining in his horse to a stop, he looked around and found the place quiet and beautiful in a luxuriant setting among green mountains. He took off his banzhi (an animal-bone thumb guard worn by archers), threw it into sky and told his bodyguard: "Where the banzhi drops is to be my burial place." In the second year of the Kang Xi reign (1663), Shun Zhi's tomb, Xiaoling mausoleum, was built at the foot of Changduan Mountain marking the beginning of the Qing Dynasty East Tombs. After that, Emperor Kang Xi and his concubines were also entombed in East Tombs. As construction was about to begin, Emperor Kang Xi sent higher officials of the Ministry of Rites from the Manchu and Han nationalities, together with two imperial commissioners, to map the location of the tombs. Later, another pair of higher officials of the Ministry of Public Works from the Manchu and Han nationalities were sent to inspect. Talented officials from eight banners and other officials from the Ministry of Public Works also assisted in the management. During construction, equipment commonly used included compass, hoisting jack and winch. Construction methods were strictly prescribed. For instance, the foundation must be dug deep with many wooden stakes and pegs. The foundation of Long'en Palace of Empress Dowager Ci Xi was dug more than four meters deep, and 685 cypress stakes and 8,881 pegs were driven into the ground with earth packed tight around them. The roof of the castle of Empress Dowager Ci Xi's mausoleum has five layers of plaster alternating with layers of compacted earth. Each plaster layer was 9.9 cm thick. In addition, the juice of glutinous rice was added to the plaster, resulting in a castle roof still in solid condition despite many years' erosion by wind and rain. As another example, for underground palace was built, iron hooks, stakes and pegs were added to normal stone connectors again resulting in a very solid underground palace. Layout of the East Tombs In the center of East Tombs under the main peak of Changduan Mountain is the tomb of Emperor Shun Zhi. On the five-kilometer-long spirit path are the large red gate, locker palace, big and small decorated arches, stone creatures, gate of dragon and phoenix, single-arch bridge, five-arch bridge, seven-arch bridge, dismount tablet, Long'en palace, Long'en Gate, silk burning furnace, Long'en Hall, color glazed gate, gate with two supporting pillars, five stone arches, soul tower and roof of the castle. All these building structures are arrayed along a brick spirit path twelve meters wide. The big red gate is the main entrance of the East Tombs. A magnificent, six-pillar stone arch stands in front of the gate. A golden colored picture carved on the stone arch remains faintly visible. Besides, there are a stone unicorn and the tablet inscribed "Officials Dismount From Horse Here" to illustrate the dignity of feudal emperors. On both sides of the red gate was originally a wall of geomantic omen, with only traces remaining. Through the red gate and to the right on the spirit path there once was a locker palace where the people paying homage at the tombs changed their clothes. Now, it no longer exists. The spirit path was paved with three layers of large bricks and decorated with stone creatures. 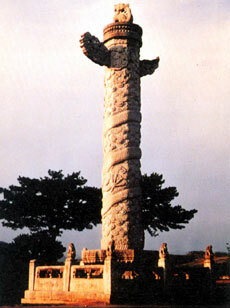 Starting from the stone ornamental column (or watching pillar), eighteen pairs of stone animals and human figures were arranged at fixed intervals. Among them are horses, elephants, unicorns, courtiers and military officers. 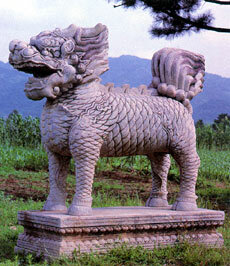 There are eight pairs of such creatures in Yuling Mausoleum and five each in other mausoleums. Beyond the stone creatures, the big decorated arch is the main structure on the spirit path. This arch is double eaved with four ornamental columns, each over ten meters high. In the center of the arch stand two Tablets of Devine Merit and Sage Virtue each set on the back of a dragon headed turtle. The tablets are made of jade carrying inscriptions by Emperor Shun Zhi both in Manchu and Chinese. After the big stone arch is the gate of the dragon and phoenix. It is a building with six pillars with dragon and phoenix patterns on glazed bricks and tiles. Stepping in the gate of dragon and phoenix makes one feel as though he / she has entered a room. 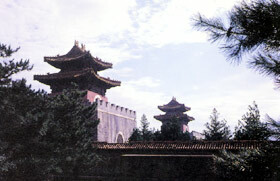 Between the big red gate and the gate of dragon and phoenix, various buildings are arranged in a variety of visual angles, giving visitors a series of new and constantly varying impressions of the compound. On the north end of the spirit path is a small pavilion. Inside the pavilion is a stone tablet set on the back of a stone turtle. The tablet is inscribed with the Emperor's reign title and the name of the mausoleum. Lying to the east of the small pavilion are a sacred kitchen and two three-room storehouses. The sacred kitchen is a five-room unit used for cooking sacrificial offerings; the storehouses are compounds for horse breeding. Immediately north of the small pavilion are three bridges each with three arches, matching the others on the approach to the small pavilion. Under the bridges flows the Yudai (Jade Belt) Stream (also known as Dragon Beard Ditch). Further north is Long'en Palace. On both sides as one enters Long'en Palace are five wing rooms and three guard rooms. On east wing are tea houses and dining rooms; cakes and fruits were served in the west wing rooms. At that time were submitted tributes from here by the Ministry of Rites. The guard rooms were used by those on duty. The Long'en Gate has five rooms with single eaves. 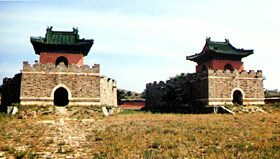 High red walls flank the gate which is directly in front of the Long'en Palace. 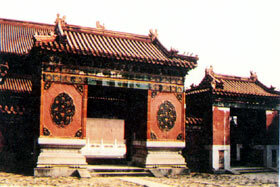 Under the eave is the name of Long'en Palace carved on a horizontal board in Manchu and Chinese. This was the site of memorial services. The platform once held a brass tripod, deer and cranes, all long since disappeared. The palace is fronted by a brick slope. East and west of the main room are wing rooms and at the south end is a silk burner, used by prayers to burn paper money or place sacrificial offerings. The back door of Long'en Palace is decorated with color glazed tile in three arches. A wall divided the palace's rear area into two segments, the imperial court and a living area. On the north face of the palace stands the color glazed door. Passing through the two pillars door, one sees a five-piece stone altar. A stone incense burner placed in the center of the altar is decorated with patterns and its four legs are in the shape of elephant trunks. The burner is flanked by stone flower vases and candlesticks. After the five-piece stone altar is the magnificent Soul Tower with double eaves in the style of flying rafters. The slopes are flat and gutters curve up. Inside the tower is a tablet inscribed with the title of the tower and the name of the tomb in Manchurian, Chinese and Mongolian languages. Under the Soul Tower is the Square Castle. On both sides of the castle is a city wall extending around the entire tomb area, which is called Baocheng (Treasure Castle). The forepart of the Baocheng connects with a glazed screen wall formed into the shape of a crescent moon; hence the name, Crescent Moon Castle. There are stairs on both sides of the Crescent Moon Castle which lead to the Soul Tower and there is a paved path on the upper part of Baocheng lined with a lower wall. The large mound in the center of Baocheng is the grave of the Emperor and Empress which is called Baoding (Precious Dome) or Dulongfu (Single Dragon Mound). To the south side of Baoding is a glazed screen wall under which is a tunnel leading to the underground palace of the Emperor and Empress. The Tombs of Emperors and Empresses In the Dongling area there are five emperors' tombs, four mausoleums for fifteen empresses and five cemeteries for 136 concubines. Outside the geomantic wall were originally located cemeteries of princesses and crown princes. 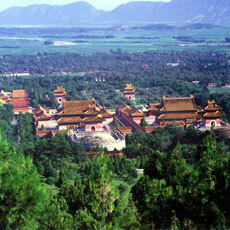 With each emperor's tomb in the center, the cemeteries of empresses and concubines were built closest around it. 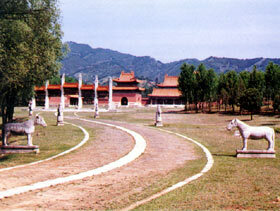 All emperors' tombs were placed either to the east or the west of Xiaoling Mausoleum. Xiaoling Mausoleum The Xiaoling Mausoleum is central of the Shun Zhi mausoleum. 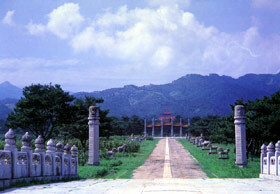 It is located at the foot of Changduan Mountain in the center of the mausoleum complex. Emperor Shun Zhi, also going by the name of Fu Lin (1636-1661), was the first emperor after the Qing court moved inside the Great Wall. Only six when he ascended the throne. The eighteen years of his reign brought great changes to China and its history. In the first year of Shun Zhi reign (1644), a peasant army led by Li Zicheng overthrew the Ming rule in Beijing, which was in turn betrayed by traitor Wu Sangui and the Qing Army defeated Li Zicheng and occupied Beijing. Shortly, Shun Zhi came to Beijing from Shenyang and made Beijing the capital. In the 18th year (1661) of his reign Shun Zhi died in Yangxindian (the Hall for Cultivating Character) in the Forbidden City. In the summer of the second year of Kang Xi reign (1663), Shun Zhi's coffin was buried in Xiaoling. 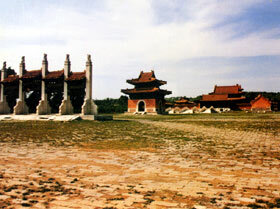 Half a kilometer east of Xiaoling Mausoleum is Xiaodongling where seven empresses and concubines were buried, induding Xiao Huizhang and Duan Shun. Jingling Mausoleum This is the tomb of Emperor Kang Xi, located to the east of Xiaoling. Built in 1681 in the 20th year of the Kang Xi reign, it is nearly as large as Xiaoling Mausoleum and columns of the Long'en Palace are particularly magnificent. The Kang Xi reign lasted for 61 years, one of the longest in Chinese history. To the east of Jingling are two cemeteries for Kang Xi's concubines, including Tai Fei and Jing Fei. Yuling Mausoleum The mausoleum is the tomb of Emperor Qian Long, located in Shengshuiyu west of Xiaoling Mausoleum, coveting an area of over 690 mu. Qian Long's reign lasted for 60 years from 1736 to 1795. 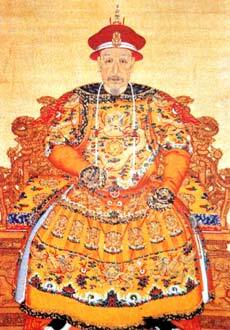 In the 60th year of his reign (1796), Emperor Qian Long enthroned his son and became overlord for four years. When Qian Long was on the throne China was flourishing, but as he left the throne it was beginning to decline. In the 4th year of the Jia Qing reign (1799) Qian Long died at age 89. 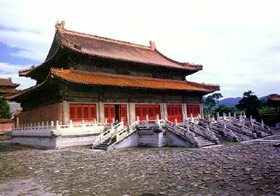 Yuling Mausoleum is a tomb in which the emperor, two empresses and three concubines were buried. At present the underground palace of this tomb is open to public. A traditional arch stone structure, unique in construction, the underground palace is 54 meters long, consisting of three rooms and four doors with an area of 327 meters. Carved on the walls and ceiling of the palace are large-size eight stone bodhisattvas, four heavenly kings and Buddhas, five-piece stone altar, with thousands of words of Buddhist sutra and incantation in Sanskrit and Tibetan. All these carved works are in sharp relief with clear-cut lines and vivid figures. As many patterns as there are, they are arranged systematically with differentiation between principal and subordinate. This underground palace with its art treasury is a witness to the luxurious life led by feudal rulers, as well as a crystallization of the wisdom of the laboring people. The cemetery of concubine Yu Fei lies half a kilometer west of Yuling. The latter housed 35 remains including those of Wulanala, Qian Long's empress. Dingling Mausoleum It is the tomb of Emperor Xian Feng, located in Pinganyu, west of Yuling. During Xian Feng's reign from 1851-1861 the Qing government was on the verge of collapse. The Taiping Heavenly Kingdom Revolution (I85I-I864) and the Second Opium War took place during that time. On the 11th year of his reign (1861), Emperor Xian Feng died at the imperial Summer Resort in Chengde, Hebei Province, at the age of 31, a victim of a life of dissipation. In the 4th year of the Tong Zhi reign (1865), Xian Feng was buried in Dingling. Empress Xiaodexian was also buried in this underground palace. 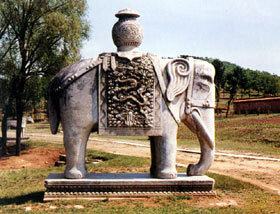 There are two other empresses' tombs from the Xian Feng reign. One is called Puxiangyu East Dingling and another is called Putuoyu East Dingling. The Puxiangyu East Dingling It is the tomb of Niuyoulushi, another empress of Emperor Xian Feng. She was respected as Empress Dowager Ci An after Xian Feng died. Together with Empress Dowager Ci Xi, she attended to state affairs behind the screen after a coup d'etat in 1861. But military and political powers were retained by Ci Xi. In 1881, Ci An died in Zhongcuigong. Cause of her death was a mystery. The Putuoyu East Dingling It is the tomb of Xian Feng's concubine, Nalashi. After Xian Feng died, Zai Chun, Nalashi's six-year-old son, succeeded to the throne under the reign title of Tong Zhi. So she was promoted to be empress dowager and her title of honor is Ci Xi. In the 11th year of Xian Feng reign (1861) she worked hand in glove with her brother-in-law Yi Xin, launched a coup d'etat, wiped out her political enemies and directed state affairs from behind the screen. Thus, she became an unofficial empress during reigns by Tong Zhi and Guang Xu for 48 years. The Empress Dowager died in 1908. Three years after she died, the Qing Dynasty came to its end with the Revolution of 1911. Ci Xi's tomb was exquisitely constructed in a unique style. 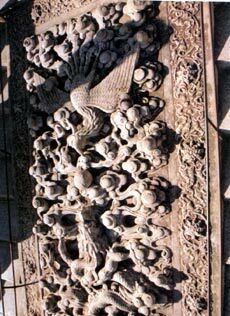 It ranks as the best for building details among the tombs of the Qing Dynasty. Railings around Long'en Palace are replete with carved motifs of roaring waves, floating clouds, dragons and phoenixes symbolizing auspicious omens. The stone steps in front of the palace are carved with three-dimensional phoenixes and dragons playing with pearls appearing as living dragons and phoenixes moving and dancing in fleecy clouds. 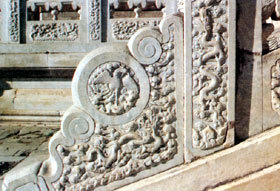 Motifs of phoenixes are purposefully arranged above those of dragons. According to tradition, dragon symbolizes emperor while phoenix stands for empress so dragon should be put above phoenix. Carved on walls are intricate designs marking happiness, prosperity, and longevity. On the arch beams and ceilings are gilded golden paintings such as a golden dragon coiled around all exposed pillars. These kinds of designs are not seen in other mausoleum palaces. The underground palace of Ci Xi's tomb has been opened to visitors. This is the first underground tomb of an empress to be excavated in China, so far. Huiling Mausoleum It is the tomb of Emperor Tong Zhi, located in Shuangshanyu, 6 kilometers southeast of Jingling. Tong Zhi became emperor when he was six years old. He reigned as a puppet emperor for thirteen years from 1862 to 1874 and died at the age of 19, short-lived emperor of the Qing Dynasty. Huifeiling is the tomb of Emperor Tong Zhi's concubine, half a kilometer west of Huiling. 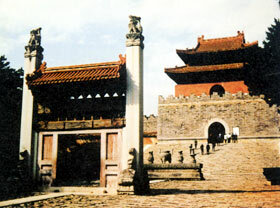 Another tomb, the Zhaoxi Tomb of Empress Xiaozhuangwen, is located outside the big red gate. Why should one tomb be built outside the big red gate? The reason is that originally she was a concubine of Huangtaiji Emperor Tai Zong (1592-1643). When Emperor Kang Xi was on the throne she was respected as empress dowager. During the reigns of Yong Zheng and Qian Long, 45 years after her death, she was regarded as Empress Xiaozhuangwen. She was Emperor Shun Zhi's mother but she lived over 20 years longer than Shun Zhi. She died at the age of 75 in the 26th year of the reign of Kang Xi (1687). Tai Zong was her first husband, Huangtaiji, who was buried in Zhaoling Mausoleum, Shenyang, according to court rules her body should be buried near Zhaoling Mausoleum. Still, there is a question why she chose Xiaoling Mausoleum in preference to the expected Zhaoling Mausoleum. The reason is not merely that Emperor Kang Xi and his father were dear to her heart. There is a story behind it. It is known that at the beginning of Shun Zhi reign she was respected as the mother of the country. But as she remarried her brother-in-law, she became wife of regent Dorgon. Though this may not have been an astonishing act, it is, nevertheless, rare in Chinese history. Regent Dorgon was haughty and domineering when he was on throne, falling into disrepute and becoming the target of very strong public criticism by the time he died. She was, of course, reluctant to be buried with him under these circumstances. Huangtaiji was her former husband but since she had married her brother-in-law after his death, both feudal concepts and religious superstition militated against the burial with her first husband. Thus she did not have much choice but to ask to be buried near Xiaoling Mausoleum. At first, complying with Xiao Zhuangwen's last words, Kang Xi built a "Zhananfeng Temple" on the south of Xiaoling Mausoleum. But in the second year of his reign (1724), Emperor Yong Zheng built the present mausoleum for her, calling it "the West Zhaoling Mausoleum." Based on the name, it approximated in appearances the Zhaoling Mausoleum of Huangtaiji in Shenyang, the West Zhao]ing Mausoleum is several hundred kilometers from Zbaoling Mausoleum, the only instance of such a burial among Qing Dynasty mausoleums. Grave Robbers After the fall of the Qing Dynasty, and because factions from the Revolution of 1911 could not agree, separationist warlord regimes fought ceaseless wars against one another. In the chaos of war, grave robbers were very active. Tomb guards left by former Qing governments no longer had wages, so they often stole, or helped to steal, what they were guarding. Trucks full of cultural relics stolen from mausoleums were common sights on the roads of Jixian County at that time. Under the rule of warlord Zhang Zuolin in Northeast China, the time saw so much was stolen that even most trees in the mausoleum areas were felled. In 1928, such a large scale grave robbing operation occurred that almost all the underground funeral objects of the Huifeiling, Yuling Mausoleum and Putuoyu East Dingling disappeared. On June 12 of that year, Ma Futian, Regimental Commander in the 28th Army of Zhang Zuolin quietly occupied Malanyu. Sun Dianying, another warlord, however, ordered Tan Wenjiang, one of his military leaders to capture the tomb area. At dawn on July 2, Ma Futian was driven away and Tan's army looted the mausoleums in Malanyu. After that, Sun's army went straight to the area of Qing East Tombs, pretending to engage in war exercises in the area. Tan Wenjiang placed policemen all around, denying access to the area and signs declared the army was "protecting the Tombs" to reassure the way. At midnight the engineering corps blew up the entrance, opening the passage leading to the underground palace. The stone door was pried open to give access to the rear room of the grave. Then Sun Dianying gave first priority to officers above battalion commander level to collect treasure for themselves. Finally, ordinary soldiers were allowed to take the leftovers. The robbers first took the large treasure objects placed around the remains of Ci Xi, such as jadeite watermelons, grasshoppers and vegetables, jade lotus and coral. They even grabbed objects found beneath the body and ravaged the corpse itself, taking her imperial robe; tearing off her under clothing, shoes and socks, and taking all the pearls and jewels on her body. They even pried open Ci Xi's jaws and took the scarce pearl from her mouth. Finally they looted the objects under the coffin which had been favorites of Ci Xi when she was alive. While Tan Wenjiang was robbing Ci Xi's tomb, Han Dabao, Brigade Commander under Sun Dianying led another army to Yuling Mausoleum and declared his intention to conduct war exercise. They blew the entrance of the underground palace, struck through the first, second, third and fourth stone doors and rushed into the rear room of the tomb. The coffins of Emperor Qian Long and his two empresses and three concubines were pried open: all the valuables from these coffins were looted and the skeletons thrown into the mud. The looting operation was directed by Sun Dianying, who inspected from his car. When a truck had been filled with the valuable booty, the army fled quickly. The soldiers then rushed to Yuling Mausoleum and the underground palace of Putuoyu East Dingling and looted what they could. Finally, local riffraff snuck into the two underground palaces to pick up leftovers. This kind looting left nothing in those two mausoleums except broken coffins; an inestimable lost. Newspapers reported the grave robbing and the news spread throughout China and around the world. People were outraged. Emperor Aisin-Gioro Pu Yi, who had dismissed Sun from his post, sent telegrams to Chiang Kai-shek; Yan Xishan, Commander of Garrison Force in Beijing; the Central Committee of Kuomintang, and local newspapers asking them to punish Sun Dianying severely. Many others also called for punishment. However, Sun Dianying bribed those who were in a position to discipline him and nothing was done.